A while ago, I gave it a shot to make a Pineapple Upside Down Cake…and was very impressed and happy with how it turned out. 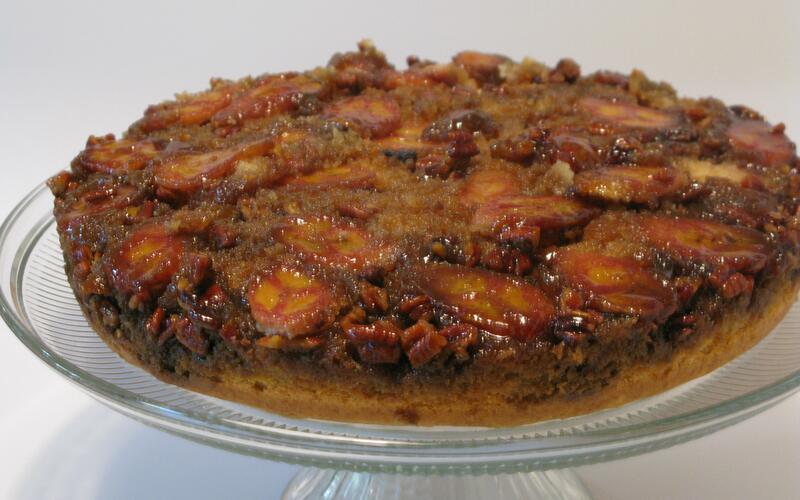 So, naturally, when I was looking for more Fall Recipes, I came across this one…and stopped. And since I made Bananas Foster several months ago and will never forget about how delicious that was, this recipe was added to the “to do” list. Immediately. With the original recipe I was looking at, the cake was made from scratch. Although it was good, I still felt like it was lacking in a couple of areas, and decided to keep it simple by using a doctored cake mix recipe that I’ve used many times, but changing around the ingredients to include banana, vanilla, and cinnamon flavors throughout the cake. This way, when the banana, pecan, and caramel rum topping is literally the icing on top of the cake for this one. This cake is moist, delicious…and I’ll definitely be making this one again. Melt butter in small saucepan. Remove from heat, stir in brown sugar and rum. Continue stirring until smooth. Spoon into an even layer in a 10 inch round cake pan. Slice bananas diagonally, place over the sauce in pan. Sprinkle pecans on top. Cover with cake batter, bake for 30-40 minutes, or until cake is a light golden brown and cake pulls away from sides of pan. Preheat oven to 350 degrees. Combine all ingredients in medium size mixing bowl, beat with electric mixer at medium speed for 2-4 minutes. Spoon batter over banana, pecan, and caramel rum topping. Bake for 30-40 minutes, or until cake is a light golden brown and cake pulls away from sides of pan. Cool in pan for 10-15 minutes, turn out to cool completely.